Things went from bad to worse for Watford on Monday night, as captain Troy Deeney was sent off just minutes after Arsenal took an early lead. It was a nightmare start for the hosts, as Pierre-Emerick Aubameyang pounced on a Ben Foster error to break the deadlock after just nine minutes. 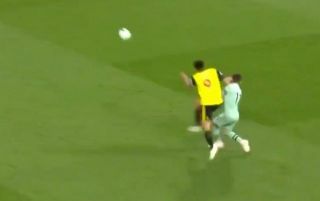 Shortly after, Deeney received his marching orders from the referee after seemingly catching Lucas Torreira with an elbow, as seen in the video below. It looks rather innocuous on first glance, but the replays would suggest that the Watford ace may well have left his elbow out and certainly caught his rival. Either way, Craig Pawson deemed it worthy of a straight red card, and so Arsenal will fancy their chances of securing a crucial win as they continue to battle for a top-four finish in the Premier League this season to secure Champions League qualification.
? – Deeney sees red! Seconds after going behind, @WatfordFC's captain is sent-off for an elbow on Lucas Torreira! ?